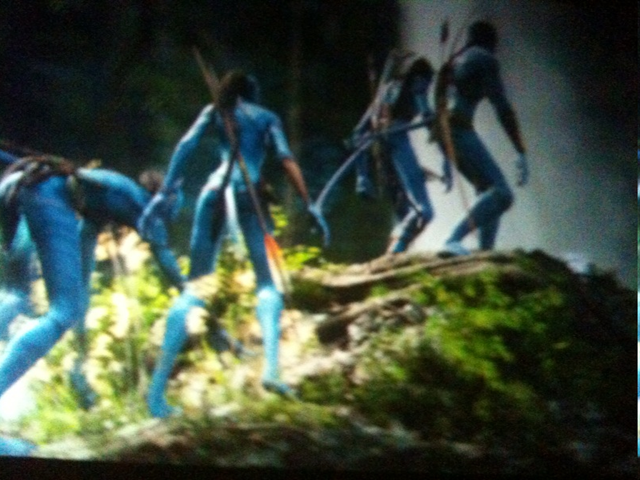 Like many others, this weekend I watched the blockbuster movie Avatar with family. I had high expectations going in as relatives and friends who had already seen the movie had rave reviews, a must see. Here’s what I thought about the movie overall, what I liked and didn’t like. A very enjoyable movie but not up to the legendary status that my expectations built it up to going into the theatre. I’ve heard some compare it to the original Star Wars series and I didn’t feel it lived up to that type of standard. Not much can. However, I did feel the movie going experience was top rate—the imagery was fantastic, particularly of the floating mountains and the natural vegetation and wildlife in the Pandoran ecosystem. Also, the flying scenes with the Na’vi and the mountain banshee flying through floating mountains were most definitely a vivid visual experience. Reminded me of the art and game play of the Glu Mobile iphone game Glyder, which reached the Top 2 games on the iphone earlier in the year. The 3D effect was well done although 3D movies using the glasses at times gives me a headache. I wonder if there is a way to create an equally memorable experience without the 3D effect. Not sure what it would be like to see the 2D version at an IMAX theatre which may offer such an experience. The story was fairly typical of science fiction movie with invaders presenting the good vs evil storyline. The twist being who the hero of the movie ultimately sides with. But while some have questioned the overall richness of the plot, I felt the movie’s story kept me engaged and the almost 3 hour length of the movie didn’t feel too long. Symbolism was aplenty in this movie with clear themes around warfare and subtle commentary on the US war in Iraq, environmentalism and maintaining the ecosystem around us and not destroying it for purely economical reasons, and views on natives to a particular area (such as Native Americans in N. America, and the aboriginees in Australia) and how they’ve learned to exist as one with the ecosystem around them vs live separately from it and use it and abuse it as they please. Also, a spiritual bent is included in the symbolism in the book, where discussion about energies and energy centers describing the Na’vi’s life is held. Fantastic computer generated imagery. Can’t be matched. Symbolism about learning to truly live within your ecosystem. Flying scenes with the mountain banchee’s through the mountains—felt like a video game (which I haven’t seen yet, but I know is out there). The epic nature of the film. It felt like an epic from the beginning. It’s not equal a Star Wars but a notch below. However, it did feel like the Return of the Jedi at times during the period of that movie when the Star Wars gang is on land with the ewoks. Some holes in the storyline. I can’t understand why the Na’vi let Jake and Grace’s avatar into their community in the first place. They knew they were outsiders yet they let them in. Where did they think they were coming from? Political commentary—whatever you think about the Iraq war, I don’t think the movie needed to be so obviously made parallel to some of the common perceptions related to the Iraq war. It takes away from the movie—the storyline and impact of the movie could have been the same with some slight tweaks for the reasons for the humans being there. Overall, 3D was done well but in a 3 hour movie, after a while the 3D effect started to give me a headache. Overall, a very enjoyable experience that is worth seeing at a theater even for the casual movie goer, who only sees a movie or 2 at the theater a year. I look forward to the sequels that Cameron has previously stated that would follow if the first one was successful.